A voter that did not receive their email notice for a "known" reason shows as "Undeliverable" in your voter list. For more information on undeliverable notices, please refer to our article on that topic. A voter that did not receive their email notice for an unknown reason shows as "Not Voted" in your voter list, as opposed to "Undeliverable". This is because, in these situations, Electionbuddy does not receive a bounce-back notice, so it looks like it was received. In the majority of cases, this is a result of a spam filter that has completely captured the email without sending Electionbuddy a bounce-back notice. It's frustrating for you, it's frustrating for your voters, and it's frustrating for us, too! If your voter has an alternative email address, you can edit your voter's contact information to replace it with the alternative email address. Electionbuddy will automatically send the original notice to the new address. You can try sending them a reminder, but there is a chance that whatever stopped the voter from receiving their original notice will also prevent them from receiving the reminder. We only suggest using the reminder in this scenario if you and your voter have done something to try and increase the chance that the reminder will be received, such as adding invitations@mail.electionbuddy.com (the email address we send our notices from) to their contact list. You can surface and share the voter's access key with them. Click on the election's name in your "All Elections" page to be brought to that election's "Results" page. Surface the access key. 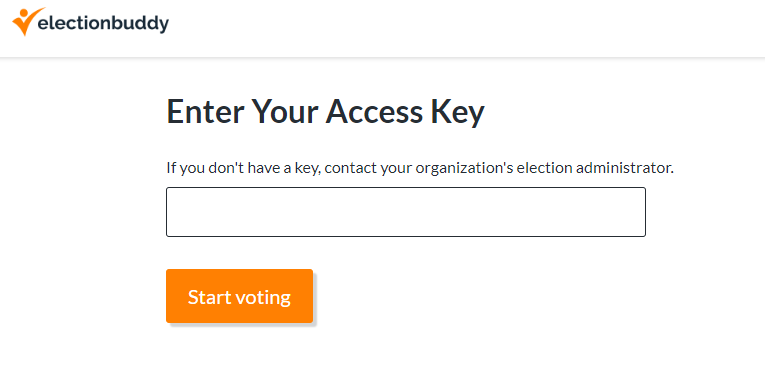 To surface the access key, check the checkbox associated with the voter whose access key you'd like to surface, and then from the drop-down menu that appears, click on the "Show Access Key" link. That will take them to your ballot!